My original intention for AFT this week was to do an all-shoe rundown. That immediately went out the door when possibly the worlds’ best fitting button down shirt came across my desk. I’ll keep an all-shoe post on the to do list for another week. As with most things I wear, I have rules concerning button down shirts. I’m a big fan of button down collars on shirts without a tie. Not so much with one though. Call me crazy but why would a person take the time to dress up a look with a tie and then cinch it off with a couple of buttons on a shirt? Let it breathe. TOMS is notorious for two things: their great “One for One” mission/cause to match every pair of shoes purchased with a donation to a child in need and the fact that their shoes are completely hideous. They took a step closer this month in creating something slightly more wearable in the fashion department. The Cordones almost resemble a real shoe now and have the option to wear laces if desired. I’ll admit, I’d come closer to wearing a pair of these than I would the saddle shoes above. There are times in my life when cause trumps design. Now that summer is officially over, its time to pick up a pair of these great retro board shorts. Slightly shorter length than what you find in Old Navy today, and a pretty sweet color scheme. They look like they were taken directly from the original Bruce Brown classic, The Endless Summer. Editor’s note: This is a MUST rent for anyone. 1966 classic. Fun for the whole family. Not kidding. Bonus: If you’re in NYC, Miami, Downtown LA or Hollywood, you can get these – or the three other designs – from a specialized vending machine. It’s really a good thing for my bank account that these are limited in both number and places to buy. 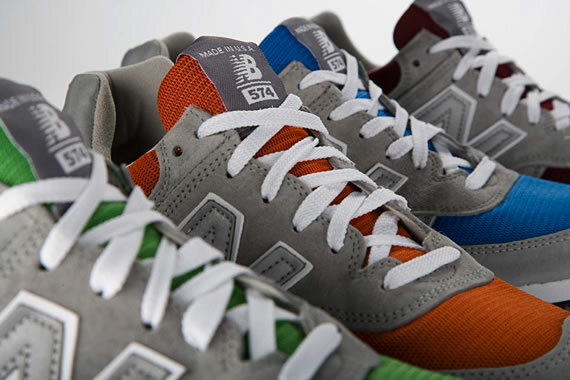 The 574 Clips are a limited edition (4 separate colors) of shoes made from leftover scraps in the New Balance factory. There will be 120 released of each color, totally 480 pairs of shoes at an extremely reasonable price of $75 a pair. Along with each pair will be a Polaroid image of your shoes in some situation that you can then visit their website to “claim” your shoe from their 480 videos. Viral marketing and design at their finest. Houston and/or San Antonio, you are not far enough away for me to completely rule out this purchase.